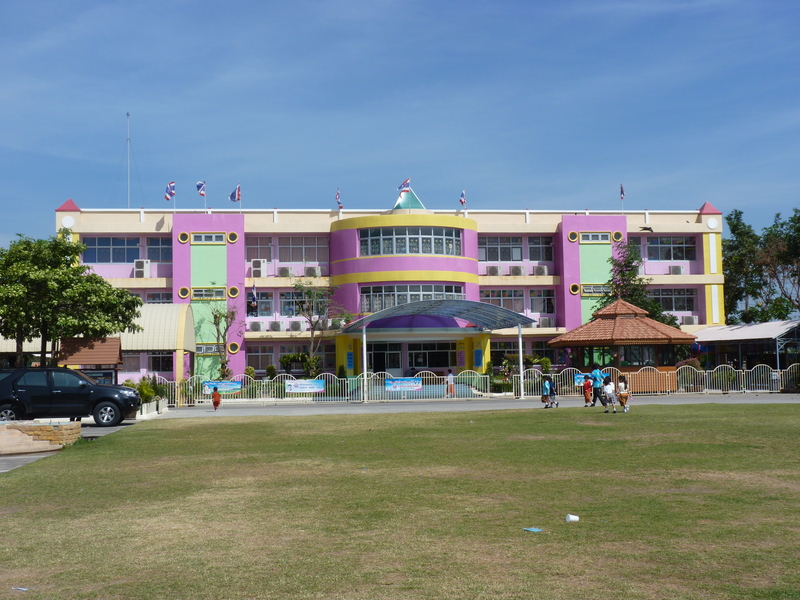 I have been teaching English at Pannawit School in Ayutthaya for three weeks. I am the only Kindergarten and first grade English teacher. 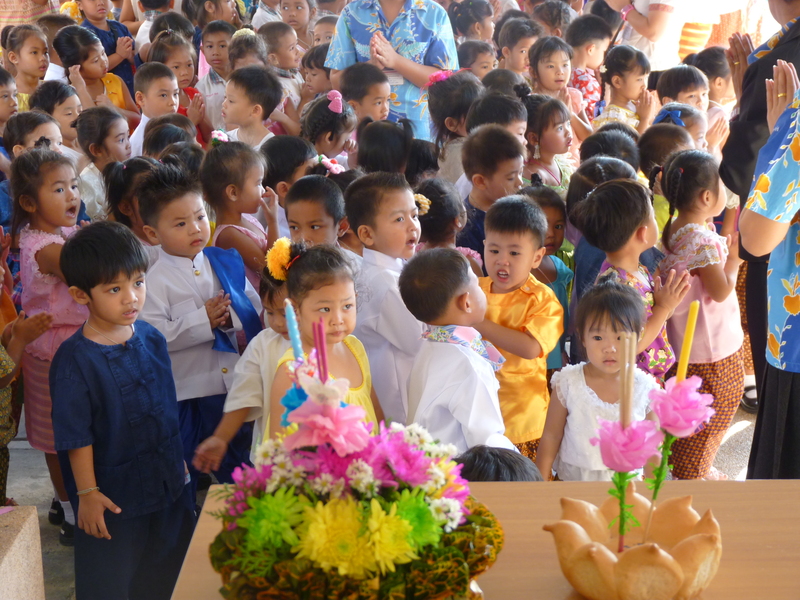 That means that I see 24 different classes every week, each containing 25-40 kids under the age of 7. At first, this seemed like a daunting task, one that would be chaotic and unorganized. However, the last three weeks have been an absolute blast. am mobbed by the entire class, each wanting their own handshake and to have me hear them say “Thank You Teacher”. It is a wonderful feeling, even though a few times I have been taken to my knees by the mob of children. At that point (and only that point), the Thai teacher will tell them in Thai to sit down (usually by slamming a ruler against the board… trust me, it is LOUD). Not a day has gone by without a hilarious story. The school itself is a sight for sore eyes. The Kindergarten building looks like it is straight out of Candyland and the children’s uniforms often consist of bright pink polos and workout pants. 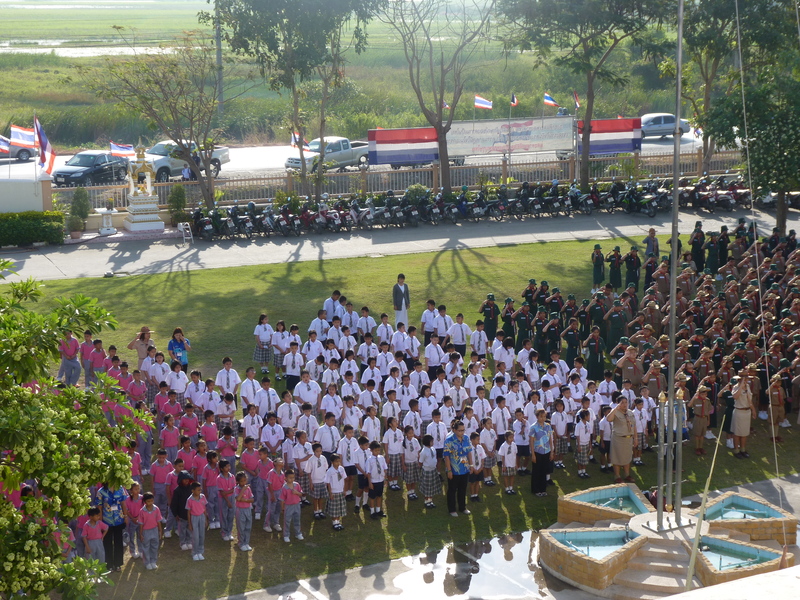 On Fridays, the primary and secondary students dress up in their scout uniforms and practice marching, usually with the help of a small marching band. Decorating the front lawn are several busts of famous men (Albert Einstein, Socrates, Etc. ), even Banjamin Frangkin makes an appearance. The art on the walls of the main building is something that cannot go without mention. Most of the scenes are completely unrelated to anything a student would learn while at school, and even go as far as being completely inappropriate (See picture to the right). 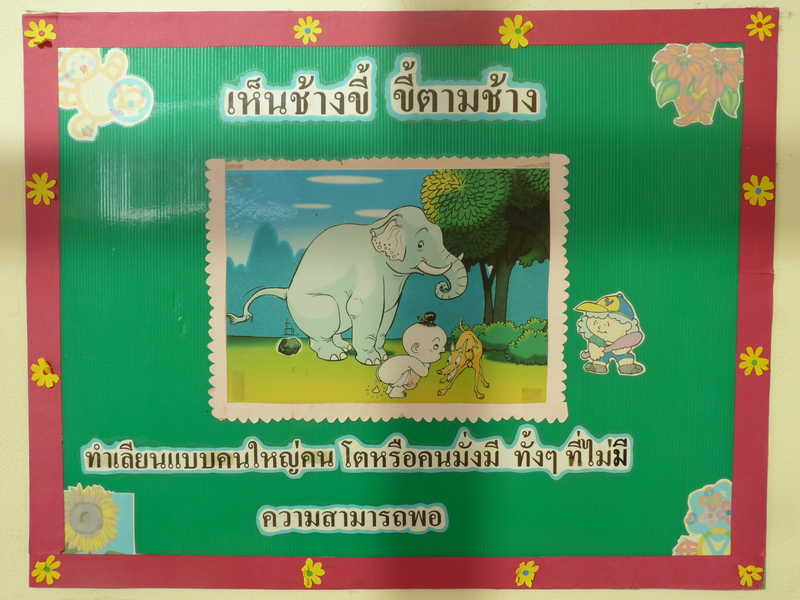 Your guess is as good as mine… these are the times I wish I could read Thai script. In the main office, Sean noticed an award that seemed out of place. Sandwiched between a picture of the Director of Pannawit meeting the King and a picture of her worshipping an elderly monk, is the “ Best public Toilet of the Year 2009” award. I guess for Thai standards, they are pretty nice. 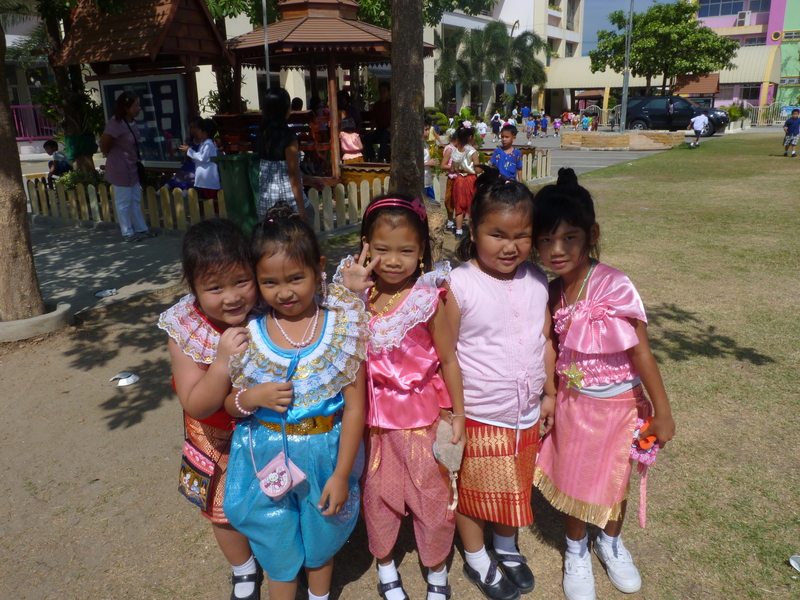 Since Loi Krathong (Thai festival) is this coming Sunday, the Pannawit students came to school wearing Thai traditional dress. For the boys, these outfits consist of a jean button down and pants (similar to a Canadian tuxedo) or a button down shirt and Aladdin type pants. For the girls, Aladdin type pants are worn with a halter top. Both sexes wear colorful make-up. 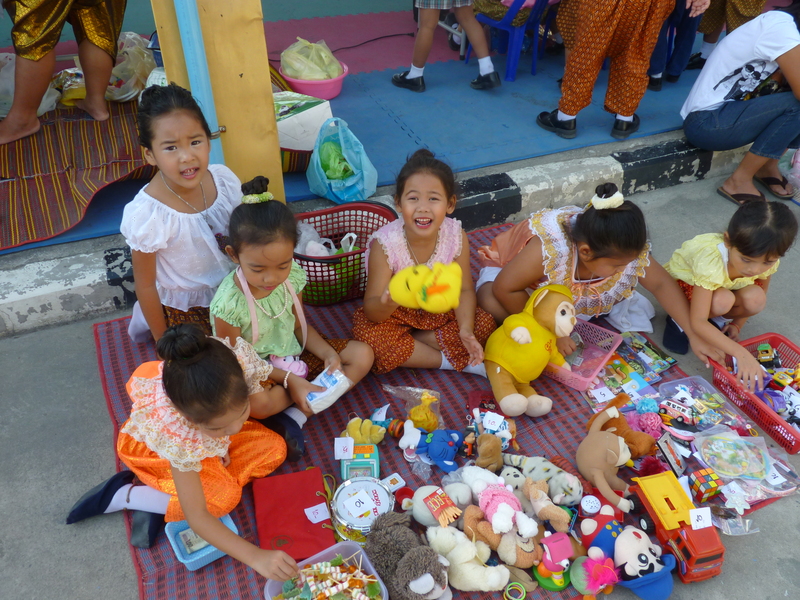 On Thursday, the students and teachers set up a “market” and sold food. There was also a beauty pageant in the canteen. On Friday, almost all classes were cancelled as another market was set up and the scouts went on an “adventure”. Sean and I finished with class and were free to leave at 1030am this morning… a wonderful surprise on a Friday. Oh my goodness, they are precious. That school is so beautiful! You can’t help but laugh when looking at it. It must be blinding in person. Wow. I wish NT looked like that I bet I would be more excited to go to school! The kids look absolutely precious too! Sounds like you guys are complete rock stars so rock on! We miss you! Enjoy!